Weening myself from four wheels to two has been transformative in so many ways. But the most significant shifts were totally unexpected. When I got on my motorcycle I began to notice that the world treated me a bit differently. First, I noticed that just being on a bike entered you into the exclusive club of bikers. 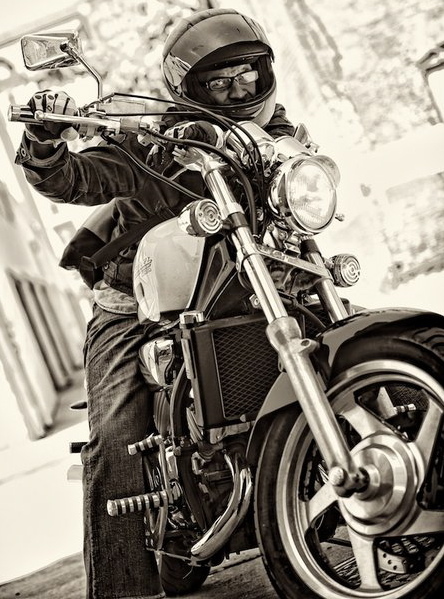 As a Black man, I grew up with warnings of danger regarding the marauding packs of leather- and denim-clad bike gangs, flying the colors of the Hells Angels and other endearing nomenclature, riding threateningly down Route 73 on which we lived. You can imagine my surprise as folk looking the same way began to extend a low, left-handed wave as we passed each other. Equally surprising were the cops. Having experienced my share of DWBs (driving while black), one resulting in being handcuffed for hours outside of Cleveland, surrounded by 6 squad cars, I had developed an enemy view of blue. Upon mounting the iron horse, traffic cops were stopping oncoming cars to assist me getting across intersections, they would gesture me to proceed ahead of them as we faced off at a light. They would walk up and start conversations, asking jokingly if they could take my bike for a spin. These club card benefits were well more than I had bargained for. The other shift was from just plain folk whom I didn’t know, seeing me carrying my helmet, would start a conversation about riding. Most of these people didn’t even ride. And as the conversation would come to an end, they would inevitably say, “Be safe out there”, with the sweetness of a family member. Who knew? Somehow, being close to death called folks to be kind ~ even if the danger was chosen. Saturday, my bike broke down on the side of the highway. I was sitting there for hours waiting for a tow truck. While I was on the phone, an off-duty cop pulled over and got out of his truck and asked me if there was anything he could do to help. He followed his offer with “I’m a rider.” Shortly after that, a wiry white dude, totally covered in fading skull, snake, and pin-up girl tattoos got out of his 4-by and said he would go back home and get his pick-up and take me home. He followed his kindness with, “I’m a rider.” It is amazing to me that it is this easy to create a bridge between cultures that have been assigned diametric opposition in our social construct. Hit me with your email and stay in the loop!